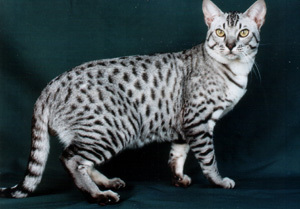 Ocicat is a middle sized or a big spotted cat, that is athletic: muscular and firm, tempting and flexible with a very, very firm and broad chest. Ocicat can carry 12 accepted colours; the basis being three colours: tawny, chocolate and cinnamon. When a ocicat carries dilute gene tawny will be transponed into blue, chocolate into lavender (lilac) and cinnamon in to fawn (beige). And to fullfil the whole pattern of 12 colours, every above mentioned colour can be combined with silver. The actual colour of an ocicat is defined from the tip of the tail. 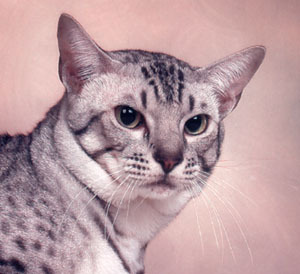 The head of an ocicat is sligtly wedged, the muzzle wends to cheecks and is clearly visible adn broad. One could say: looks like a brick in the middle of the face. Chin is strong. Whisker pads are middle sized, not too modified. The ears a visibly big and they are located in the corners of the head - not right up like rabbits. 45 degree angle should be shaped when lines are drawn from the tips of the ears to the middle of the nose. The eyes are relatively big, shaped like almonds and a bit angled to point ears. The distance between the eyes should be at least the size on one eye. The sight should be open. The body of an ocicat is quite long - not as long as siamese and orientals though. 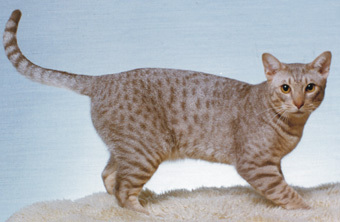 Ocicat is muscular, very very strong, firm, but not fat. The boning is strong and the general outlook is athletic. The legs are semi-long, strong and muscular. The tail is long(ish), mid-thick and slightly narrowing to the tip. The coat is very short and thick, soft and close lying. The colour should be clean, nice and clear. The pattern should be clear and the contrast strong. Further, the pattern must be visible (loud'n'clear) from any angle. The colour markings can be darked in the legs, head and tail. The typical pattern is formed of marks like thumb prints. Firther the "thumb prints" are surrounded with other thumb prints. The spotting should continue all the way to legs - the further the better. No white markings are accepted.